A council of Orthodox bishops has created a new Ukrainian church, marking an historic split from Russia which its leaders see as vital to the country’s security and independence. The announcement on Saturday came after Ukrainian priests held a synod in capital Kiev’s 11th-century Saint Sophia Cathedral to establish an Orthodox church independent from Moscow. Ukrainian President Petro Poroshenko announced that 39-year-old Metropolitan Epifaniy of the Kiev Patriarchate church is the head of the new church. His secular name is Sergiy Dumenko. 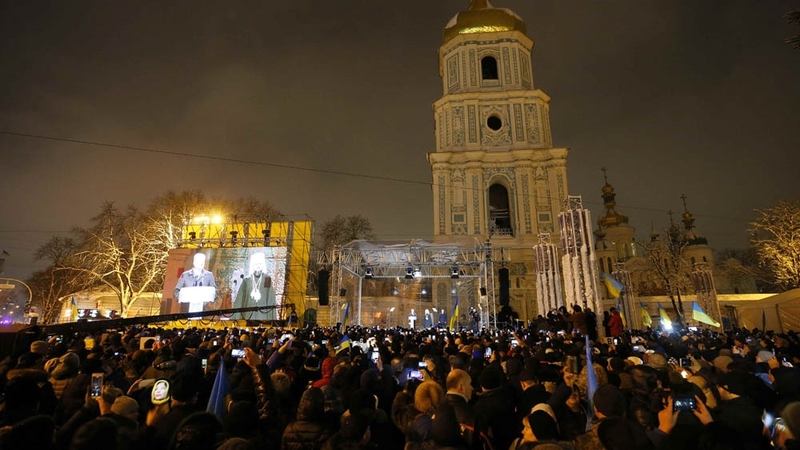 “I would like to call on all our brothers, bishops and all believers to the newly created united Ukrainian Orthodox Church,” Yepifaniy told the crowd outside the cathedral. The newly formed community is now expected to receive independence from the Ecumenical Patriarchate of Constantinople, the Istanbul-based institution considered the so-called “first among equals” of leaders of the world’s Orthodox Churches. Poroshenko said he would travel with Epifaniy to Istanbul in January to receive an official Tomos from the head of global Orthodoxy granting the new church independence. Poroshenko, who has made the creation of a new church a key campaign issue before elections next year, told the bishops that the state “did everything it could” towards the creation of the church. “Ukraine was not, is not, and will not be the canonical territory of the Russian church,” Poroshenko said, adding that an independent Ukrainian Orthodox Church was now a “matter of national security”. The synod came shortly after a maritime crisis that saw Russia seize three Ukrainian navy ships and arrest 24 sailors in the waters around Crimea. In Moscow, the Russian Orthodox Church protested vigorously and dismissed the synod as uncanonical. Vladimir Legoida, a spokesman for the Moscow church, told Russian state television that the Kiev synod had “no church, religious or evangelical meaning” and that it will have “no canonical consequences”. Representatives of Ukraine’s three Orthodox Churches attended the synod, but only two from the branch loyal to Moscow showed up. Russian bishop Metropolitan Hilarion in Volokolamsk on Saturday compared the two representatives of the Moscow-backed church to Judas. A spokesman for Patriarch Kirill, the head of the Russian Orthodox Church, vowed on Saturday that the Moscow Patriarchate will continue to work in Ukraine despite the creation of the new independent church.